A repeat c-section is often encouraged by doctors and nurse practitioners. The repeat procedure is condoned by the American Medical Association and other groups because it avoids the risk of a uterine rupture that is possible in a pregnancy after a c-section. However, there are many cons to having this procedure as well. The risk of a uterine rupture is enough to encourage many women to opt for a repeat c-section. A rupture of the uterus can be extremely dangerous to the mother as well as to the baby. In some instances, a mother with a rupture faces the loss of her uterus. In extreme cases, the rupture can lead to the death of the baby and/or the mother. With a scheduled, repeat c-section, the mother doesn't have to endure labor. This generally means less pain during the birth process and less fatigue once the baby is born. For mothers who have already experienced a c-section, having another one means having a birth experience that she is already familiar with, making the process less frightening. It also assuages any fears she may have of a uterine rupture. Most doctors and nurse practitioners prefer their patients have a repeat c-section instead of having a vaginal birth after a c-section (VBAC), making it easy to find and choose a doctor or nurse to help with the pregnancy and delivery. In some states, midwives are forbidden to attend a VBAC because of the risk of a rupture. A home birth may also be illegal if you have had a c-section in the past. The risk of a uterine rupture during a VBAC is real, but it is not very likely. The likelihood of a uterine rupture when a woman has a VBAC is just .2% to 1.5%, according to the American College of Obstetricians and Gynecologists. This gives a woman who has a VBAC about a 1 in 500 chance of suffering from a uterine rupture. This low likelihood prompts many women to try for a VBAC instead of scheduling a c-section. The likelihood of complications from a c-section are generally higher than the likelihood of a uterine rupture. With a repeated c-section, the mother risks surgery complications, infections and adverse reactions to the anesthesia. The baby risks fetal injuries from the incision into the uterus. A c-section also comes with a longer recovery time. An extra two to three days in the hospital can result in hospital-borne infections. 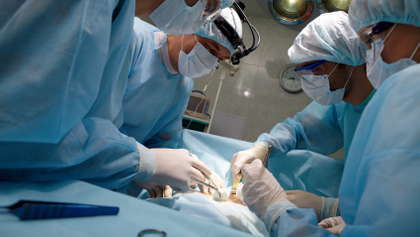 The surgery also leads to more pain than a vaginal birth as well as decreased mobility during the recovery period. With a repeat c-section, the mother may have trouble holding her baby after the surgery and can have trouble with ordinary tasks that aren't a problem after a vaginal birth. Many women who have a first c-section feel that they want to have the vaginal birth experience. Having a VBAC gives them the power to choose their own birth experience and to have the birth that they weren't able to have before.